The RAW women’s division shark tank hasn’t exactly allowed for room to hold hands and frolic. It doesn’t help that ever since Ronda arrived, the former UFC champion has had a target on her back. She’s been forced to be a wolf without a pack. She knew that. She welcomed that. Which made a match against Natalya all the more difficult. It was obvious before the starting bell that something was off. 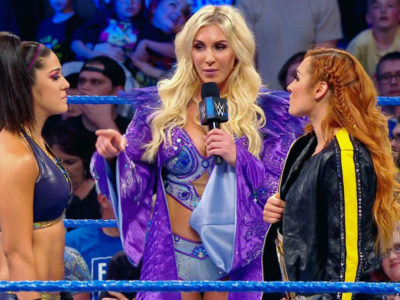 The fire in Ronda’s eyes wasn’t cooled by the cold front in the air, but her connection with the only true friend she’s had since setting foot in the WWE ring. A champion is expected to put her title on the line, but an ally added to the stakes means so much more to lose. A couple of tentative (and even) tie-ups started off the match. Natalya won an exchange and put on the pressure with chain wrestling no doubt instilled by her Hart Dungeon lineage. 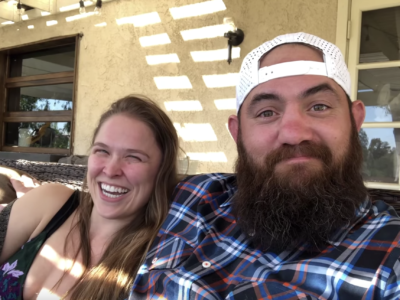 Ronda countered with her patented judo, then transitioned into submission attempts. Their trade-offs are evidence that these are two wrestlers who know each other very well. The fight heats up. If this was anyone else, Ronda would be fuming and tearing into them, but this just isn’t any opponent. This is Natalya. This is Nat. Both began talking to each other as each hit got harder and the holds became more vicious as well as complicated. Eventually, Natalya tried for the Sharpshooter but got kicked out of the ring onto the floor. There were two fights in one for Ronda. The physical battle with Natalya and the emotional war knowing that she may have to give up a friend to keep her belt. Ronda had no choice but to fight fire with fire: Apologetic punches in the corner, a running knee filled with regret, Piper’s Pit of broken promises. Hesitation, hesitation, sharpshooter reversed into an armbar. Overwhelmed with emotion after winning, tears streamed down Ronda’s face as she consoled Natalya. For a few tense seconds, it looked like any connection they had snapped potentially like the ligaments in her arm. 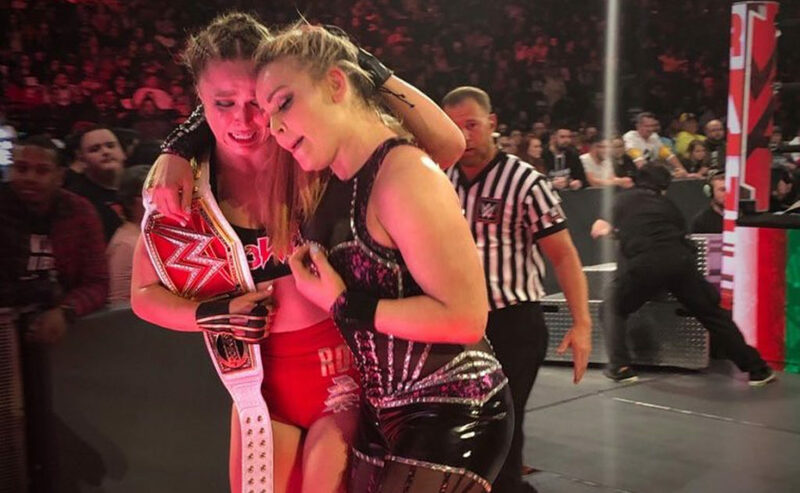 However, just as the suspense reached its max, Natalya embraced Ronda and the two shared a beautiful moment: As competitors, as women, but more importantly, as friends.